Last summer I made oreo cookies and cream cheesecakes for one of the girls’ birthdays (the original “pinned it” post!) They were pretty popular so for today’s fifth annual charity bake sale at work, I decided to give them a second go. 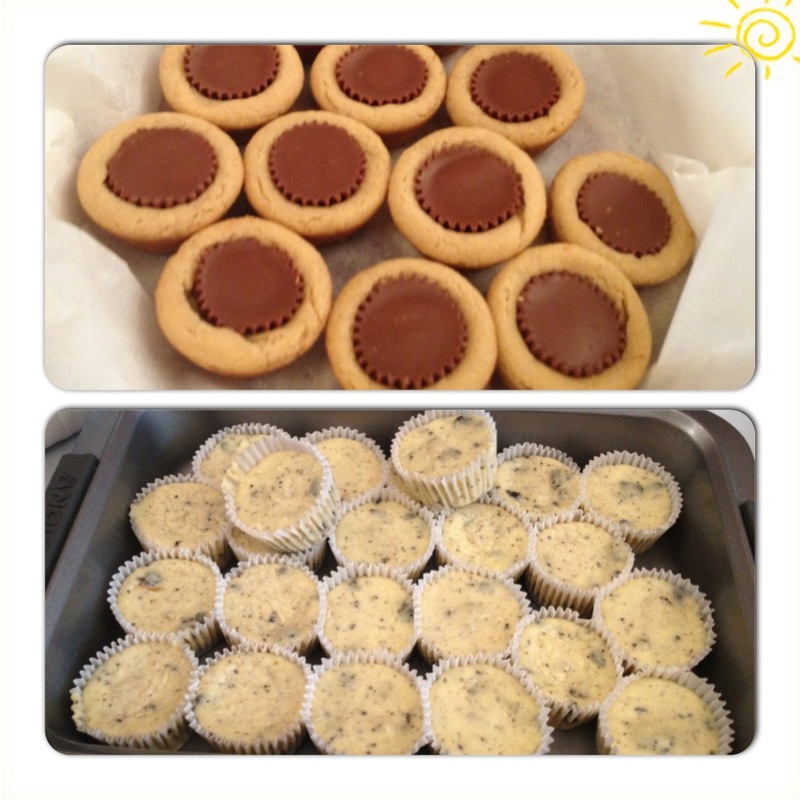 I also made my mom’s practically famous peanut butter cup cookies. (When she visits NYC, friends always greet her with “Did you make cookies?”) I’ll have to check before I share her recipe but for the time being, enjoy this oldie but goodie (and original!) pinned it recipe. Directions: Preheat oven to 275° F. Line muffin tins with paper liners. Place 1 whole Oreo cookie in the bottom of each lined muffin cup. Beat cream cheese on medium-high speed until smooth, scraping down sides of the bowl as needed. Gradually add the sugar, and beat until combined. Beat in the vanilla. Drizzle in eggs, a little at a time, beating to combine and scraping down sides of bowl as needed. Add in sour cream, beat to combine. Using a large spatula, fold in the chopped Oreo cookies. Divide batter evenly among the cookie-filled muffin cups, fill each cup almost to the top. Bake, rotating muffin tins halfway through, until the filling is set, about 22 to 28 minutes. Transfer the muffins tins to a wire rack to cool completely. Refrigerate (in the muffin tins) at least 4 hours (ideally overnight). Remove from tins just before serving.